Securities in Hastings Diversified Utilities Fund continue to do well, reaching $2.83 on 7 November. Shares in Energy Action reached a new post IPO high of $2.60 on 8 November. Shares in Transpacific Industries continued the rapid fall that began around the time of the annual general meeting at the end of October and form their recent high of 95 cents plunged to a one year low of 66.5 cents on 7 November. Shares in CBD Energy fell to an all time low of 1.7 cents on 6 November, only a day after they re-commenced trading after a one month halt. Clean TeQ Holdings has won a $2.41 million odour control contract with The Central SEQ Distributor trading as Queensland Urban Utilities to design, install and maintain five odour control facilities around Brisbane. Completion and commissioning is expected by the end of June 2013, and the Service and Maintenance part of the deal has annual options to be extended. The five facilities will utilize Clean TeQs OdourTeQ biological air treatment technologies. Clean TeQ delivered Queensland Urban Utilities four odour control facilities in Brisbane two years ago. CMA Corporation has commenced further restructuring measures to focus on its core business regions due to weaker demand in the global metals recycling sector and challenging economic conditions in major markets. The company will reduce costs wherever possible and concentrate on key operations in Australasia. CMA is rightsizing its operations, including reducing staff numbers in certain states to lower operating costs, however, the company will continue to have a significant presence across Australia, said managing director, John Pedersen. No metal recycler anywhere in the world is immune from the market forces now at work and we are determined to keep a close eye on costs and other aspects of the business which we can control, he said. Australian investors with energy stocks in their portfolios need to consider the performance fallout they may face from a nearly energy independent USA, say Nathan Lim and Mason Willoughby Thomas who run the Australian Ethical International Fund. The increasing US energy independence, the high cost of Australian energy production, and the ASX 200's 28 per cent exposure to the energy and materials sector pose portfolio risks for Australian investors. Issues at play include the combined impact of increased production from Canada, steady offshore production from the Gulf of Mexico and booming onshore shale oil and gas production. These are poised to give the US increased energy independence in the coming decade and rewrite the politics of oil as the geopolitical importance of Middle East oil to North America is reduced. Australian investors will face increasing export competition for local natural gas sales as up to 10 LNG export facilities in North America are seeking approval to export shale sourced natural gas into Asia and Europe. These international and local developments could benefit clean energy investors. The International Equities Trust is themed around global smart energy and investments focusing on the supply and demand of clean energy. We believe this all round exposure to the critical themes of climate change and energy security presents a compelling potential for long term growth and outperformance, they said. August Investments has revised its analysis of Tox Free Solutions and made a small initial investment in the waste manager. August Investments' managing director, Damien Lynch, said that at first sight Toxs statistics are not spectacular dividend yield of just 1.4 per cent, an earnings yield of 5 per cent with a PE of 20, but the cashflow yield is 9.2 per cent. However, growth over the last two years has been spectacular with earnings per share (EPS) up 29 per cent per annum and cashflow per share up 15 per cent per annum on revenue increase of 32 per cent per annum. Mr Lynch said this assessment is at odds with his article about Tox published in Eco Investor this June. He explained, We saw problems with Toxs increasing cost of sales ratios and occupancy costs relative to sales ratios over several years. Mr Lynch sees Tox Free Solutions as a growing, highly specialized business in a sector which is being mandated by community concern and government legislation. There are strong barriers to new entrants based on the highly technical and costly nature of toxic waste recycling and disposal. For green investors such as August Investments, the environmental benefits are a bonus. Toxs share price has been trending up since mid year and reached a 10 year high of $2.96 on 2 November. 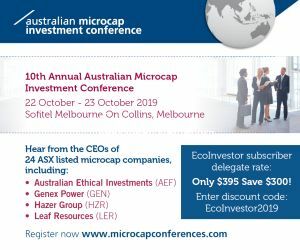 The ASX asked tyre recycler Carbon Polymers numerous questions about its viability as a going concern, its ongoing efforts to raise capital, and whether its financial condition warrants continued listing on the ASX. Managing director Andrew Howard responded with a long letter covering each concern. He said the company has taken steps to get an unqualified audit report for the current and future financial periods, and is currently obtaining a valuation of plant and equipment acquired from Reclaim Industries. He also said the companys level of borrowings is conservative: the ratio and debt to capital ratio are both under 25 per cent, implying that most of the company's assets are financed through equity and the company is not highly geared compared to its peers. The company is also negotiating a debt facility for future expansion. Mr Howard said sales and production for the current financial period are higher than for the previous reported period. If needed, the company will raise additional capital to fund operations, and directors and major shareholders have offered further funding if required. Orbital Corporation has been changing from a consulting services business to a supplier of specialized engine and vehicle systems, and its approach is similar to its joint venture Synerject, which has provided consistent growth and solid earnings and cash flow over many years, said chairman, Peter Day. But, unlike our investment in Synerject, we want to directly control the businesses we develop so that we have full access to profits and cash, he said. Mr Day said Orbital is making progress on this new strategic path but challenges have delivered financial and other outcomes that were not anticipate and have disappointed shareholders and the board. Orbital made a net loss of $3.1 million for 2011-12, but there are some positives the company can take out of what was a very tough year. Revenue rose 35 per cent to $22.1 million. System Sales increased by 140 per cent to $14 million, and included Orbital Autogas Systems liquid LPi system for Fords EcoLPi Falcon and LPG kits to the aftermarket through Sprint Gas Australia (SGA). Orbital now has over 100 liquid LPG kits for the aftermarket. Despite the challenging market with national LPG volumes falling due to low petrol prices and reduced Government support, OAS and SGA managed their costs and increased market share. 42 per cent owned Synerject, which is not consolidated in Orbitals revenue, grew revenue by 5 per cent to US$127.5 million and profit after tax by 10 per cent to US$8.0 million. Timber flooring company Style could recommence ASX trading if a recapitalization proposal is implemented. However the recapitalization is likely to significantly wipe out current shareholders. Style has agreed to a recapitalization proposal with Otsana Pty Ltd, which trades as Otsana Capital, and that involves a one for 100 share consolidation. - Up to 100 million free options for the purchase of one share each, with each option exercisable at 1 cent within four years at an issue price of $0.00001 to raise up to $1,000. $500,000 of the funds raised would pay out an existing debt to Strandtec Pty Ltd. The balance would be used to develop the existing business, look at new business opportunities, and for working capital. The company is in a deed of company arrangement (DOCA) which will result in the extinguishment of all pre-administration creditors. The DOCA should be effectuated in January 2013 and the plan is to complete the recapitalization around the same time. The proposal needs shareholder approval, a minimum of $1.75 million being raised by Otsana through the above equity raisings, and the DOCA put into effect. Electric scooter maker Vmoto has seen a second big jump in its share price on the announcement of a second scooter manufacturing contract. The shares jumped 48 per cent or 1.3 cents on news of a manufacturing and supply agreement with German electric scooter company E Tropolis GmbH. Vmoto will produce three of E Tropolis electric scooter models on an OEM basis. A minimum of 15,000 units over three years represents a total sales value of $24 million. Vmoto will produce the electric scooters at its Nanjing manufacturing facility commencing early 2013. Other benefits could flow to Vmoto such as growth in the European market and synergies between the two companies, especially in R&D and technology. E Tropolis markets, distributes and sells electric scooters, electric bicycles and solar carport systems worldwide. It is part of a large Solar Business Group in Germany. It currently has four electric scooter models available through its dealer network in Germany, Italy, Spain, United Kingdom, Netherlands, Belgium, France, Bulgaria, Hungary, Czech Republic and Switzerland. Jan Christian Schroder, general manager of E Tropolis, said the agreement with Vmoto is a logical step for E Tropolis to strengthen its position as one of the leading companies for electric mobility in Europe. It will see a change from silicon battery to removable lithium battery for the companys Retro, Bel Air and Milano models. Lynas Corporation has won a legal battle in Malaysia over its rare earths plant, and is to raise up to $200 million in a fully underwritten institutional placement and a partially underwritten share purchase plan. The Kuantan High Court has denied an application by parties associated with the Save Malaysia Stop Lynas (SMSL) group for an injunction against Lynas Temporary Operating Licence (TOL). There is now no injunction or stay preventing Lynas from operating its Malaysian plant. Lynas said it is also pleased that the Kuantan High Court has added Lynas as a party to the application by SMSL for a judicial review of the Ministerial decision to dismiss an appeal against the Atomic Energy Licensing Boards approval of the TOL. The hearing of the judicial review application is expected in a few months. The Malaysian government and Lynas said they intend to strongly defend the Ministerial decision. The institutional placement is at 75 cents per share. It comprises a $60 million institutional placement under current placement capacity, and $90 million subject to shareholder approval. The share purchase plan will be at the lower of the price paid by institutional investors under the placement or a 2.5 per cent discount to the five day volume weighted average price after the offer period. The $50 million share purchase plan is partially underwritten to $25 million. Funds raised will be used for working capital and corporate purposes during commissioning and ramp up at the LAMP. Galaxy Resources is raising $81 million via a placement to cornerstone investor M&G Investments and new cornerstone investor the East China Mineral Exploration & Development Bureau (ECE). The two tranche raising will see Galaxy issue 162.4 million shares at 50 cents each. For tranche 1, M&G has subscribed for 30 million shares for $15 million, increasing its interest in Galaxy to 19.3 per cent. Tranche 2 comprises ECE subscribing for 132.4 million shares for $66.2 million. This will give ECE a 19.8 per cent interest and reduce M&Gs interest to 16.4 per cent. Tranche 2 is subject to due diligence by ECE, and approvals from the Jiangsu Provincial Development and Reform Commission and Jiangsu Provincial Department of Commerce, registration with China National Development and Reform Commission and PRC Ministry of Commerce, approval from the China State Administration of Foreign Exchange Jiangsu Branch, Australias Foreign Investment Review Board (FIRB) and Galaxys shareholders. Tranche 2 is expected to be completed during first quarter 2013, and ECE will be offered a non executive board position. The placement will be used to reduce debt, including the maturing Lithium One convertible notes, complete the Definitive Feasibility Study and forthcoming pilot plant work at the companys Sal de Vida Lithium Brine and Potash Project in Argentina, and for working capital. Orocobre has raised $21 million by placing 12.35 million shares to institutional investors in Australia, Hong Kong, UK and US at $1.70 per share. The company will offer a share purchase plan for up to $5 million at the same issue price. The share placement was 50 per cent oversubscribed, said Orocobre. The lead manager and book runner was Cannacord Genuity (Australia) Ltd, with support from Cormark Securities Inc., and Patersons Securities Ltd. The proceeds will fund Orocobres remaining equity contribution for the construction of the Olaroz lithium project, fund Borax Argentina initiatives, and working capital. With completion of this raising, Olaroz is fully funded through to production, he said. AnaeCos shares fell to a new all time low of 2.8 cents on 8 November. Clean power company Enerji has delivered two site assessment reports to prospective customers, and one of these has begun detailed contract negotiations. The comprehensive site report incorporates a mutually agreed commercial proposal. Enerji said the customer has requested an examination of its two other sites under the same assessment process. Both of its mine sites are powered by reciprocating diesel generators and are well aligned with Enerji's core technical and commercial capability. The other report, for an industrial site, revealed significant potential for the application of Opcons Powerbox technologies in conjunction with Enerjis heat capture expertise. As Enerji previously foreshadowed, this is a more sophisticated application potentially involving five Opcon units. Hot Rock has been granted an application for what it says is an exceptionally prospective geothermal project in southern Peru. The Achumani project is 90 kilometres north of the city of Arequipa and displays all of the characteristics of high quality volcanic geothermal systems that are commonly developed for electricity around the world. * Volcanic heat sources with a boiling upflow of geothermal water in a reservoir in areas of high volcanic terrain. * Steam vents or fumaroles, boiling mud pools and hot springs formed from condensed steam. * Gas chemistry from fumaroles indicating temperatures in the deep portions of the central geothermal reservoir of greater than 300oC. * Outflows of deep liquid in the central upflow forming boiling surface springs around the base of the volcano. * Water chemistry in the outflow springs indicating temperatures of 230oC and with higher upstream temperatures closer to the upflow. Geothermal systems of this type are ideally suited for large scale electricity generation based on conventional, high temperature steam cycle turbines, and the company believes the Achumani project meets all of these characteristics. Hot Rock said volcanic projects are commonly de risked because of the abundant surface signatures, and require relatively lower capex on the geothermal power plant because standard off the shelf steam turbine plant is suitable for high temperature volcanic systems as opposed to higher capex binary plant which are used at lower temperature locations. Panax Geothermal has secured a $5 million working capital facility via a share placement facility with New York based Deer Valley Management. Panax said the working capital facility can be drawn at call on over the next three years. Shares will be issued at an 18.5 per cent discount to the market price before the issue. Panax has no entry or transaction costs and can terminate the facility with mutual agreement prior to the end of the three year term with no fees payable. Deer Valley can terminate the facility if Panax has not drawn on the facility during a six month period. Panax said it considers the 18.5 per cent discount to market to be a reasonable discount for share placements in the current financial market. However, the large discount makes immediate capital gains attractive and it remains to be seen if Deer Valley is a serious long term investor or another overseas short term share dumper that drives down its clients share price. Managing director Kerry Parker said the facility provides Panax with adequate working capital for corporate, liquidity, and project development purposes while it works to secure the final execution of power purchase agreements for its near term development opportunities in Indonesia, and finalizes financing negotiations. Timothy W. Doede, portfolio manager of Deer Valley, said the agreement with Panax is the companys first foray into the ASX. Petratherms shares touched new all time low of 2 cents on 7 November. Directors Derek Carter, Simon OLoughlin, Lewis Owens, Richard Bonython, Richard Hillis, and Terry Kallis participated in the companys recent rights issue. Wave energy company Ocean Power Technologies has formed a new Autonomous PowerBuoy Business Unit within the company to develop opportunities for its non grid connected PowerBuoys. OPT continues with its grid connected utility systems business, but the new business unit will aim to leverage the companys leadership in the development and ocean testing of Autonomous PowerBuoys. Both the Utility and Autonomous markets are served by the same PowerBuoy technology, but the key drivers of the Autonomous market are the application needs of the prospective customers. OPT's products for this market have been developed for off grid applications such as defense and homeland security, offshore oil and gas operations and oceanographic data gathering. The company believes the Autonomous PowerBuoy market could be a significant opportunity for profitable growth. It has appointed Dr Phil Hart to the new position of Senior Vice President, Autonomous Power, to lead the development of the Autonomous PowerBuoy business. Dr Hart was previously chief technology officer since joining OPT in February, 2009. OPT has announced a Vice President of Engineering, also a new role. Like Dr Hart, Dr. Mike Mekhiche also reports to OPT's chief executive officer, Charles Dunleavy, and is responsible for the company's engineering and advanced technology development.